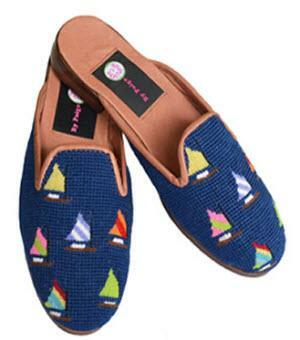 What fun these Needlepoint Rainbow Fleet of Sails on Navy are! This fun pattern features a fleet of sailboats on a navy background with matching stripes on the sides. Mules are available in the sizes: XXS (6-6.5), XS(7-7.5), S (8-8.5), M (9-9.5), L (10-10.5), medium width. They are fully lined with soft kid leather, half inch heel, composition sole and open back. The mules run true to size. They are so comfortable too!